If we had to pick one city that really takes the cake when it comes to all of the characteristics for an awesome bar scene, it has to be Boston. Beantown not only has a massive number of bars, but they’re all close to one another, offer awesome brews, and are always packed with smiling and friendly faces. But there’s only one way to discover the absolute best bars in town – a pub crawl! This year, UglySweaterEvents.com are looking to kick things up a notch in Faneuil Hall, Boston, as they’re set to host another one of their signature events. 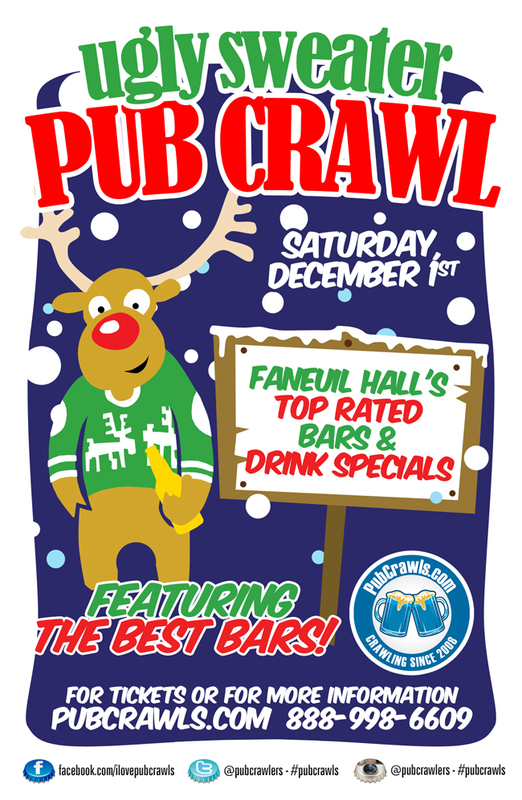 But rather than going with the typical crawl, they’ve spiced things up and are looking for everyone to bust out their Ugly Sweaters. Ugly Sweater’s you may ask? Yep! Dig deep into your closets and pull out the funkiest looking sweater you can find and come out to some great drink specials around town. That’s right, picture hundreds of crawlers dressed up in wacky sweaters roaming the streets in search of the next bar on their crawl. That’s exactly what you’ll get with this special event that will give you the opportunity to meet new friends, visit awesome bars, and take advantage of some great drinks specials that are only available for pub crawlers. Open up your closets, find your ugliest warm sweater and get ready for an amazing adventure around Beantown. All of the participating venues are located within walking distance of each other. The holiday season is quickly approaching and we need to get it started with a bang. Think about it, where else are you going to be on a Saturday afternoon in December? Why not venture out with some friends and take in the Ugly Sweater holiday festivities. Enjoy more than 12 bars of Christmas this winter. Get your tickets for this Ugly Sweater crawl event soon because this is one of the most anticipated events of the winter! Participating venues include: Hard Rock, Wild Rover, Sissy K’s, Mija Cantina, Durgin Park, The Hideout, The Point, and more to be announced!